I just received another update from Google. This notice is relevant for anyone who has a website -- if your website isn't mobile-friendly, it's time to make sure it is. 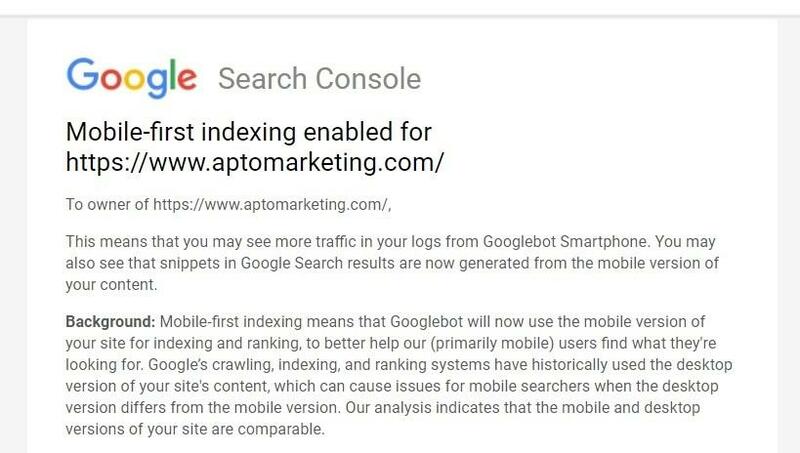 Simply because Google's search-bots rank your site according to your MOBILE version, not your desktop version (as it did in the old days). If you've got a website that lacks a "responsive" design, then it's time to get that fixed. This isn't anything new, but I've seen enough dated websites to wonder whether some folks aren't aware of how lacking a mobile-friendly site not only hurt the optics of their brand, it also damages their search rankings. My advice: either you have a modern website that meets search engine requirements and contain valuable content that cater to long-tail searches ... or DON't have one at all. Badly designed, non-compliant sites create a bad first impression. If you haven't got time to create an entire new website, then create a single Cover Page with the essentials, and build your fresh content (additional pages) over time. And make sure that single page is mobile-friendly and comparable to your site's desk-top version.